Recall the function madhavaPI() from Section 3.4.1. 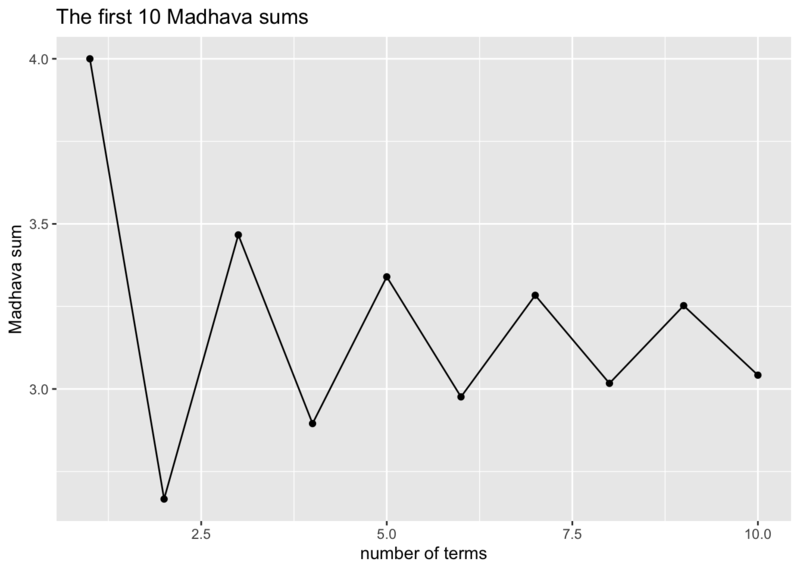 Use this function to write a function called madhavaGraph() that will do the following: given a number \(n\), the function uses ggplot2 to produce a line graph of the first \(n\) approximations to \(\pi\) using the initial terms of the Madhava series. The plot should be a line graph similar to the one produced by the collatz() functions from this Chapter. The function should take a single argument n, whose default value is 10. It should validate the input: if the number entered is not at least 1, then the function should should explain to the user that the he/she must enter a positive number, and then stop. I’ll leave Part 1 entirely to you, but say a bit more about parts 2 and 3. First we’ll think about the graph. Since it is made from functions in the ggplot2 package, you will need to make sure that you load the package when you are designing the function. ⊕ The function itself does not load ggplot2, so you should make sure to tell anyone who plans to use the function to load it! At each step in above process, we will need to store our sum in the results vector, so that it isn’t lost. define madhavaPI() inside the body of madhavaGraph(), before you start computing any sums. The latter seems to be the safer choice! You still have the task of filling in the outline completely and then testing madhavaGraph() until it works.